The anticipation is intensifying and the hype has hit a fever pitch surrounding East Village Leslieville‘s Fall 2012 launch. 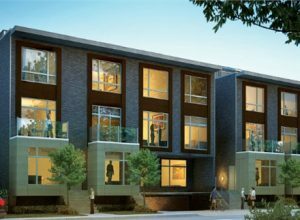 Urban Fabric Development and Aykler Developments‘ project is garnering attention for bringing even more heat to the red hot Leslieville neighbourhood. While East Village’s modern architecture and affordable prices are eye-catching, the area itself is a huge draw as well. And it’s not just Torontonians recognizing the qualities that make Leslieville a desirable neighbourhood. Porter Magazine, the reading material you’ll find on every Porter flight, included a feature on the neighbourhood in a recent issue. The piece focused on the abundance of furniture stores and boutique shops, writing that Leslieville has “officially arrived.” Leslieville’s presence in the Porter Magazine indicates it’s on the international real estate radar as a residential hot spot. The Leslieville shopping scene is certainly a big draw, but future residents will also appreciate the amount of park space within walking distance from East Village Leslieville — a true mark of a desirable neighbourhood. Greenwood Park will be a short stroll from the development while the huge waterfront oasis, Ashbridge’s Bay Park, is a quick jog away. Greenwood Park boasts an outdoor pool and an ice rink making it a year-round attraction. Ashbridge’s Bay Park is known throughout Toronto for its public boating launch ramps and pedestrian and bike trails located on the Martin Goodman Trail. It’s also worth noting that there’s now a Starbucks at Jones and Gerrard Street, an indisputable sign that the area has truly made it. Unsurprisingly, the area is enticing more families to move there. Not only will they live a short drive or TTC trip from the core, they’ll have all the amenities within the burgeoning community right at their doorstep. And when it’s time to spend some quality time with the kids, the array of park space will provide a variety of rest and relaxation options. There will be more buzz on this project coming soon so stay tuned to BuzzBuzzHome News for all the fresh info. Prices at East Village Leslieville start from the low $200s. For more info email info@eastvillageleslieville.com or visit the website to register!